Requiring no more than a working knowledge of Perl, Python, or Ruby, Methods in Medical Informatics will have you writing powerful programs in just a few minutes. Within its chapters, you will find descriptions of the basic methods and implementations needed to complete many of the projects you will encounter in your biomedical career. As subspecialty board certification in clinical informatics has finally become a reality, Jules Berman’s Methods in Medical Informatics could not be more timely. 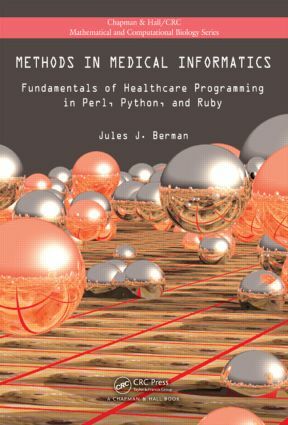 This well-written and informative text combines Dr. Berman’s expertise in programming with his vast knowledge of publicly available data sets and everyday healthcare programming needs to result in a book which … should become a staple in health informatics education programs as well as a standard addition to the personal libraries of informaticists. This book provides an introduction to processing clinical and population health data using rigorous methods and widely available, low cost, but very capable tools. The inclusion of the three leading dynamic programming languages broadens the appeal … bridges the gap from programming instruction to dealing with specialized medical data, making it possible to teach a relevant programming course in a biomedical environment. I would have loved to have a copy of this when I was teaching introductory programming for medical informatics. … presents students and professionals in the healthcare field (who have some working knowledge of the open-source programming languages Perl, Python, or Ruby) with instruction for applying basic informatics algorithms to medical data sets. He [the author] provides algorithm scripts for each of the languages, along with step-by-step explanations of the algorithms used for retrieving, organizing, merging, and analyzing such data sources as the National Cancer Institute’s Surveillance Epidemiology and End Results project, the National Library of Medicine’s PubMed service, the mortality records of the US Centers for Disease Control and Prevention, the US Census, and the Online Mendelian Inheritance in Man data set on inherited conditions. Jules Berman, Ph.D., M.D., received two bachelor of science degrees (mathematics and earth sciences) from MIT, a Ph.D. in pathology from Temple University, and an M.D. from the University of Miami School of Medicine. His postdoctoral research was conducted at the National Cancer Institute. His medical residence in pathology was completed at the George Washington University School of Medicine. He became board certified in anatomic pathology and in cytopathology, and served as the chief of Anatomic Pathology, Surgical Pathology and Cytopathology at the Veterans Administration (VA) Medical Center in Baltimore, Maryland. While at the Baltimore VA, Dr. Berman held appointments at the University of Maryland Medical Center and at theJohns Hopkins Medical Institutions. In 1998, he became the program director for pathology informatics in the Cancer Diagnosis Program at the U.S. National Cancer Institute. In 2006, he became president of the Association for Pathology Informatics. Over the course of his career, he has written, as first author, more than 100 publications, including five books in the field of medical informatics. Today, Dr. Berman is a full-time freelance writer.